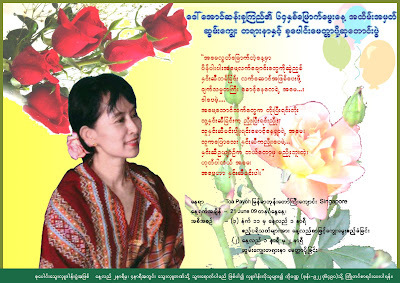 You are cordially invited to the special event of celebrating the 64th birthday of our beloved Daw Aung San Suu Kyi in appreciation of her sacrifices for the country, her noble qualities and especially her unrivalled role of being the national leader our time. We will be serving the monks with breakfast, the attendees with lunch and listening to dhamma discourse and having a prayer session for her liberty. Once again, let's come together in love of Daw Suu and Burma. Please kindly forward this invitation far and wide.